Today, there are many different types of popups; they all work really well in generating new leads for online businesses. Back when online businesses had newly started booming, entrepreneurs didn't exactly have a soft spot for the popup. There was a debate in the online community about whether to use web popups. It was partly due to their shabby, and often spammy implementations. In the early days of online marketing, several websites deployed the annoying entry web popup. It grabbed the entire screen area before the visitor could even read the content. Visitors would turn away without seeing the website; valuable traffic was lost because of entry popups. This led to reluctance in deploying web popups among many web entrepreneurs on their site. If done right, the advantages of web popups far outweigh their shortcomings. Here is a detailed evaluation of how web popups work and why you should keep using these web popups. Sales is a complicated, often a long stretched-out process. It’s pretty rare for a customer to make a purchase on his first visit. So, to continue the conversation after the first visit of the customer, we use email marketing. 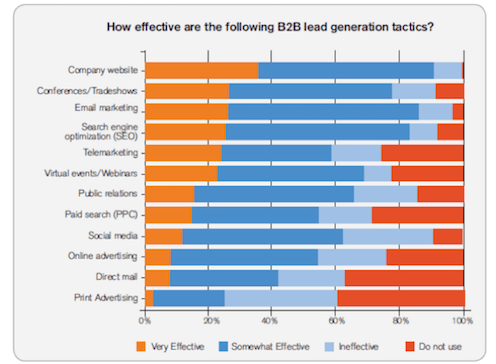 As per many market reports, Email Marketing is the second most effective B2B lead generation technique, right after the company website. As we can see, email marketing is more than 80% effective in generating leads. In today’s world of information saturation, the attention span of visitors has reduced considerably. Also, the visitors’ buying patterns have changed. Customers now prefer hunting for their own product; they want to control how they buy products and services. They are not going to shell out their pockets on the first visit, the nature of lead generation has changed from a “transaction” to an elongated, multi-phase “conversation” with the leads. As shown in the above graphic, email is clearly one of the best ways to have an effective conversation with the customer after the first visit. It is possible to achieve a conversion rate as high as 9% with web popups. Conversion rates rarely go above 3%. In academic terms, a 9% conversion rate is equivalent to a student getting an A+. Of course, these rates are not typical. A lot of work goes into creating web popups that deliver such high conversion rates. However, popups are still the primary way to convert website traffic into leads. If you drop these leads, it's going to be tricky to grow your email list from other sources. Do you have an e-commerce website and you are struggling to drive sales? There are at least a couple of ways popups can help you improve sales. First, you can use a popup when the customer is about to abandon the page (called an “exit popup”). In this popup, you can offer a discount coupon, provide free shipping, or inform about a sale period. The call-to-action (CTA) button on the popup takes the departing visitor and sends him right to the offer page. A customer who was about to close the website is pulled back in by using the web popup. This is a clinical saving of the potential lead that could have been lost without the use of popups. Secondly, even with the existing customers, you can use marketing analytics to gather insights about each customer’s behavior and their buying patterns. You can then use web popups to cross-sell and upsell products/services of different categories. These tactics are best used on an e-commerce product pages. However, you can also use it on a blog or landing pages. The way this works is: A customer is prompted with an exit popup showing a countdown. This is a good use case of “scarcity marketing” to create the “fear of missing out” (FOMO) or illusion of limited stocks. This drives the customer to click the CTA. After he clicks the CTA, he is shown a discount code. Sometimes, the code and CTA both may be shown but the core element is still the FOMO-inducing countdown. It still works the same way, just involves less number of steps for the customer to grab the offer. This code is applicable only if the customer buys before the countdown hits zero, or else he loses the incentive. The incentive for buying can be anything: a discount code on the current or the next purchase and/or free shipping. All customers like freebies and this will definitely prompt the customer to reconsider abandonment. Given that 70% of the e-commerce carts all over the world get abandoned, popups are a great way to improve your cart abandonment rate. Customer feedback popups require the customer to answer a short, multiple-choice question before clicking the exit button (i.e. CTA of this popup). It can even be a single, direct question about the experience of their session. This can be used as a quick survey at the end of customer service chat session or on a support page. You can also use this on the click of a “Cancel” button to collect exit feedback. This popup is a fantastic style of collecting the feedback. If placed correctly, it can collect valuable insights without disrupting the customer experience. However, do not go overboard with the number of survey questions. It should not be so long else user will lose his patience and close the tab.